sewtakeahike: 2 books, 2 inter-reviews. I've had the opportunity to review four really great new books recently, Quilt Lovely, Dear Quilty, Stitch Wear Play, and Simply Sewn. So I'm going to take today and next Monday and split them into two posts. Today I'll be reviewing and doing a short author interview for the two books, Quilt Lovely by Jen Kingwell and Dear Quilty by Mary Fons and Team Quilty. Quilt Lovely is just that. Lovely. The pages are filled with inspiring quilt and pillow designs. And true to Jen's style, the book is very eclectic on many levels from her designs and fabric use to the techniques she utilizes. Her self professed love is to hand sew, however, due to time constraints she says she machine sews as well. The appendices at the end of the book are chock full of info and tips ranging from hand piecing, applique and quilting to machine piecing using templates and one of her patterns even uses foundation piecing. My favorite pillow in the book is this one called Home Run. It's simple and effective. And in sharp contrast, the Glitter quilt is seizure worthy, full of so much information and worthy of spending an afternoon taking in all the fabrics and it's construction. And then check out the Flutterby quilt. It's construction is template and rotary cut. As part of the review, I wanted to ask Jen a couple of questions. Here they are along with her answers. 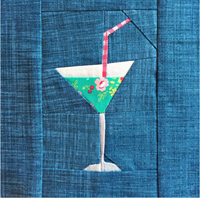 Pen: I really love the vintage look of your quilts and the Glitter quilt in your book sent me reeling! Who in your life has been most influential of your style? Jen: Glitter is my favourite in the book also. I have three daughters and when I make a new quilt someone always says "dibs". I had to get in quickly and claim this one for myself. I don't know that any one person has influenced me any more than another. I do know that my daughters let me know if they think I'm on the wrong track! Many years ago I heard the wonderful Freddy Moran speak. She said " 10 fabrics don't work but 110 do" I thought in a room full of people, she was speaking only to me. Someone had verbalised exactly how I felt. I just love print and colour. Pen: Hand sewing has never been at the top of my list, but it is slowly finding a place in my heart lately. Do you have any tips to make hand appliqué move a little faster and easier? Jen: It's all about practice. The more you do the quicker you will become. I also think you need to develope your own technique. Find what works for you, that's the most important thing. 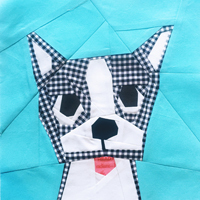 Dear Quilty showcases beginner friendly quilts and projects. The book is sprinkled with tips and advice for the novice as well as refreshers for the intermediate quilter. I was so excited to see my friend Anna's Sunny Side Up quilt in the book. I love the simplistic design! And I really think the Hoopla quilt by Erica Jackman is interesting. The blocks are all the same, her use of different fabrics are what make the blocks appear different. Here are a couple of questions I asked Mary, along with her answers. Pen: I love the helpful sewing tips sprinkled throughout your book. What is the most frequently asked question (and your answer) you encounter as you are out and about? A lot of quilters avoid the issue altogether by going with a kit, because all the fabric choices have been made for you. But I think this only works for so long. Because we all want to buy (a lot) of fabric. That’s the most fun part, right? I don’t want to sound too pitchy, but over the past year I’ve been doing a webinar series called “Color Me Quilter.” You can get it at my website (maryfons.com). I take you through the process of picking fabric through the “doorway” of focusing on a specific color every month. They’re really good and pretty popular because I treat the issue head-on with tons of examples; there’s also a ton of quilt history in each webinar because understanding how quilters in the past have used these colors in their quilts, you get crazy inspired — and there’s nothing wrong with straight-up copying the palettes they used! No one has a copyright on color. Pen: Mary, do you have a favorite piecing technique you enjoy as you make a quilt? Mary: You know what? I actually do. I am obsessed with paper-piecing. It’s basically taken over my technique. There’s no way to get the precision with straight piecing that you get with paper- or foundation piecing. Some quilters are afraid of this, but actually, quilters in the past used paper probably more than anything. I do lots of tutorials on Quilty about this and teach classes on it, too. Once you get how to start the block, you’re good — and you’ll be obsessed with it, too. Happy quilting! I think I need to add both of these to my list. They look great! I just purchased Jen Kingwell's book and also love Flutterby. I am currently working on her pattern, Steam Punk, one of her patterns. I love the idea of anything goes.